The term match the hatch is a topic that can be discussed at great length, but I will break it down to the basics for the beginner. Fish eat insects that are on top of the water as well as below. Although there is nothing more exciting in fly-fishing than catching a fish with a dry fly the bulk of their diet comes from below the surface. When imitating an insect that is above or below the water you need to not only match the type of insect, but you also need to be close in size. One way to do this below water is to use a net, a fish aquarium type, and hold it under the water for a bit to catch what is floating by. Examine what you find and try to match that as closely as possible in shape, color and size. What you collect in the net will vary by where you are in the stream, they may be different close to bank versus in the current. Fish are constantly feeding on insect larvae and nymphs as well as minnows and leeches. Since most of this eating occurs below the water, using imitations of these insects and minnows will provide you with the best results. Some basic patterns work well on many rivers and streams. You should have some success using a Pheasant Tail, Hairs Ear or Zebra Midge. Wooly Buggers work well as a leach or minnow imitation. Dry flies work great when the hatch is taking place. It is a great idea to find out what insects are common on the stream when you plan on fishing. Your best bet for reliable information will be the local Fly Shop. They can tell you what insects are present, the best time of day, what fly to use and what size. They are a wealth of information and you should get acquainted with them so you will have long-term success. Every river has its hatches that are specific to that river. There are specific types of insects that hatch at a very specific time of year and at a specific time of the day. The time of day is related to the recent temperature and weather of the area. It will vary slightly on different parts of the river. 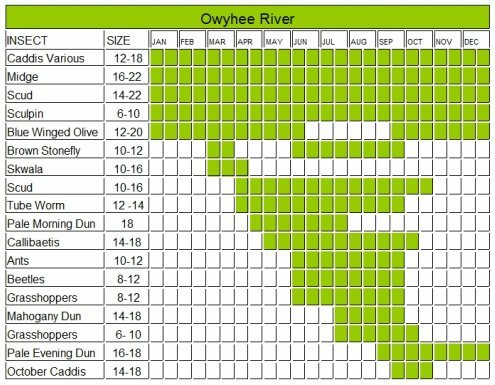 Most rivers will have a hatch chart similar to the one below. This will tell you what type of insect patterns and sizes to use during a given month. This is a starting point. Your locar fly shop worker or owner will know exactly what to use and when to use it, so be sure to get their advice. 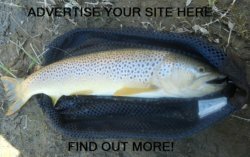 To learn more about fly fishing insects be sure to check out this website. 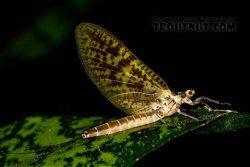 Troutnut.com: Over 3710 Aquatic Insect Pictures for Trout Fly Fishing Nuts: See over 3710 close-up photos of mayflies, caddisflies, stoneflies and other trout stream invertebrates. There are also movies, underwater photos of nymphs and larvae in their natural habitat, stream scenery, and desktop backgrounds. Learn how to identify invertebrates and how to match their behavior! For more information about flies and presentation click here. Leave match the hatch page and return to beginner page.